Whoops. And suddenly gone silent and not responding to inquiries. She still hasn’t said whether she will forego her Congressional salary after saying that Congress taking a salary during the shutdown was wrong. 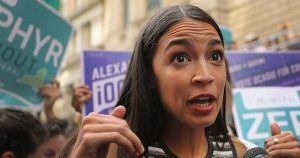 Democratic Rep. Alexandria Ocasio-Cortez’s 2018 congressional campaign was fined by the state of New York for failing to provide the proper workers’ compensation coverage to campaign staffers. “This coverage is vital to ensuring workers are protected for on-the-job injuries,” Stewart continued.